I know it’s summer and I should be all relaxed and laying on a beach in Punta Cana, Dominican Republic, but that’s just in my dreams, the reality is that for most moms, summer means double the work. Kids are always hungry, recital rehearsals, swim practice and let’s not forget that we still have to work, right? well, the thing is that not only I feel overwhelmed with my children at home since I work from home, but I’ve been running and doing some circuit training at the park, while Liah is at swimming class, which is great, but my muscles are killing me, it is a combination of muscle soreness and stress. So I want to share with you this wonderful tip that is helping me relieve the soreness of my muscles and at the same time allowing me to take some me time. Soak in Epsom salt nightly: Add 1 cup of lavender-scented Epsom salt to your warm bath, some bubbles, light a candle and soak in for 10-20 minutes- Just add wine, lol. Epsom salt — actually magnesium sulfate — is one of the most versatile household products, with uses ranging from creating at-home spa treatments to soothing achy muscles to helping start or improve gardens. It’s been used therapeutically for hundreds of years, and it’s gaining a new generation of fans that are looking for a safe, easy and economical alternative. Find it in your local pharmacy or grocery store. Epsom salt added relaxes your sore muscles, decreases inflammation by increasing the blood flow to your muscles and also prevents bloating, helping you get a flatter stomach. You can also soak a clean towel in warm water with Epsom salt and place it over the sore muscle. Spirulina for natural hair growth / Espirulina para hacer crecer el cabello. Spirulina is one of those surprises and new addition to my healthy life and natural hair power foods. How I found out about spirulina? well, you all know that I am a little crazy and my blogger friend and nutritionist Fernanda from heavenlyskinnykitchen.com told me about a healthy back in shape challenge and I said “count me in”. I don’t believe I am out shape, in fact, you all know that I am very active, but I am the one that believes that surrounding yourself with positive people with your same goals in life is always a good idea, plus you don’t know what you may learn, this is how I knew spirulina and right away I started my research and what I found out is just amazing and worth to share. Spirulina is a type of algae, loaded with proteins, Vitamin A, Vitamin B 12, Vitamin E, calcium, iron and phosphorus, as well as amino acids, essential fatty acids and beta carotene. There is scientific studies that proves the effects of Spirulina on hair growth and those diagnosed with alopecia often turn to spirulina as an alternative treatment. It strengthens the immune system and it’s antioxidants effects does wonders to hair growth. Spirulina is one of the few proteins that has a high positive impact and effect containing 70 % high-valued protein which is so important for our body, hair, and nails . Spirulina comes in pills and powder, but I chose the powder to add to my smoothies, it smells similar to seaweed. Read moreSpirulina for natural hair growth / Espirulina para hacer crecer el cabello. The holidays are over but as a multicultural family, there is always an excuse to celebrate, eat and drink. If you are like me, a party curly girl, but also has a New Year’s resolution to eat healthier and loose those turkey pounds, healthier snacks and drinks can help you get in the game while keeping your new years resolution. The super bowl is the perfect excuse to get together with family and friends. I plan to make my life easier with not only easy, healthier snacks and drinks but also using Rubbermaid containers for the majority of the party food. Using plastic containers make leftover storage easier and also avoids any incident of breaking my expensive china. 1.Baked Sweet potato chips: These are awesome, crispy, healthy and flavorful – Rinse, dry and slice the sweet potatoes as you wish. Toss the slices with olive oil and sprinkle salt. Lay a single layer on a baking sheet and bake for 1.5-2 hours at 200 degrees and flip once or twice during the baking process to make sure they crisp up on both sides. 2. Stuffed Mushroom: This is the perfect snack for your healthy eating resolutions, loaded with Niacin, copper, selenium and pantothenic acid. You can pretty much stuff your mushrooms with anything, I did mine with quinoa and mozzarella cheese. Hummus is a nutritional snack that is low in calories. Chickpeas, or garbanzo beans, are the main ingredient in hummus. Chickpeas have no saturated fat, no cholesterol, high in protein, making them a perfect addition to a vegetarian’s diet or one who would like to cut back on red meat. I am all about nutrition, but also making my life easier, so I used this great tip to display this delicious snack on an upside down Rubbermaid container, using the lid as the snack plate, I added some labels and silly notes with sharpie to make it even more fun. 4. Tea in a Mason Jar: Don’t drink your calories, some people don’t take into consideration that drinks are loaded with calories, so if your New Year’s resolution is to stay healthy, this simple solution is great and loaded with antioxidants. The cool thing about this is that nobody will notice that you are drinking tea, because the mint makes it look like a mojito, lol. Brew the green tea, when cooled down, add honey and lemon to taste and mints. Since I am going for an easy solution, I will display the waters and drinks in a Rubbermaid plastic container as well. 5. Rasberry spritzer: If you like a more fancy, martini look alike, try this delicious and low calorie drink. Mash a few raspberries and add sugar (optional) pour it in a martini glass, add sparkling water and decorate. I used sharpies to customize my glass. Hair loss can affect both male and female, and like almost anything in life, prevention is the key. Right after Prince Guillermo was seen eating a big bowl of asparagus at a restaurant, the green vegetable was in very blog and tv shows. Some people concluded that he was eating asparagus because of it reputation in helping with hair loss. Its high content of vitamin C reduces free radicals and protects the immune system. Prevents the appearance of baldness or alopecia. Its B vitamins promote the proper functioning of the central nervous system. How lucky am I to be able to celebrate Christmas all the way till January 7th,? In Dominican Republic, and most parts of Latin America and Europe we celebrate the three kings day on January 6th, this day is like Christmas to us, because this is the day when kids and adults actually receive presents, read more here . The tradition (In Dominican Republic) is basically just leaving the tree kings some cookies, milk and grass for their camels. I try to keep all my traditions intact no matter where I am, it is not an easy task, but certainly not impossible.. This holiday I have been eating like crazy, and for that reason I am ready to get my healthy eating back on track, so I won’t take any excuses for any unhealthy habits, and for this reason in celebration to the 3 kinds day, I will treat myself with a healthy day, just like a queen. Place the cut and peeled banana in a bowl, place in the freezer. Once frozen, place the bananas, avocado, milk, sugar and vanilla extract in a blender. Blend at high speed, enjoy!! For more Recipes visit TomaLeche. And since we are working with avocado (my favorite natural ingredient for hair) Let’s do a hair mask, agree? Combine and mix well: One avocado, One egg and a lemon juice. Apply the mixture to your hair for about 20 minutes (as a pree-poo).– I do not recommend applying any source of heat to homemade masks, in this case you could cook the egg, auchhh.– Lemon can change your hair color if exposed to the sun.– Rinse and follow by a sulfate free shampoo. style as usual. Winter is here to stay for a few months, and in order to stay warm and healthy from the inside out, hot drinks can be our best friend. One way to do so, that I learned from Mexicans, is with this delicious and hair friendly ponche. 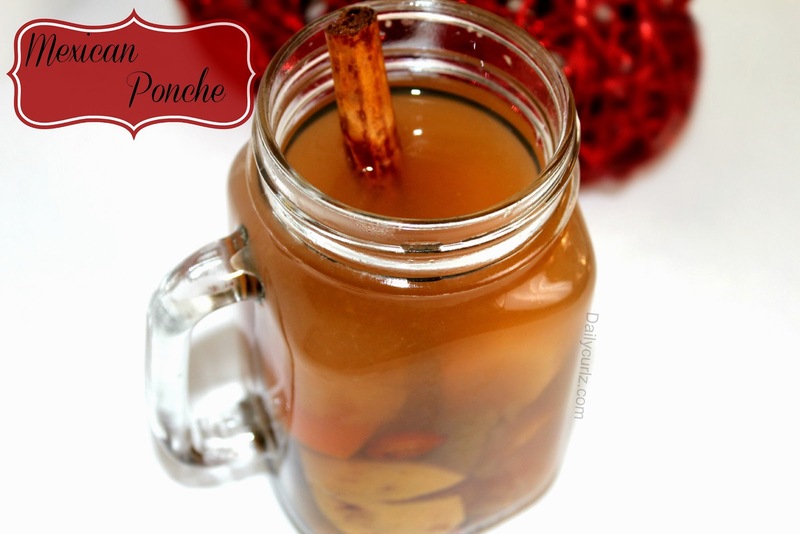 This ponche is made with fruits, and you may find a variety of recipes all over the web, but mine of course is light and hair friendly. water, I don’t have to explain how good water is for our hair, right? Sugar Cane, rich in calcium, iron , magnesium and potasium. Walnut, Raisins, Prunes and almonds are optional but I highly recommend them.